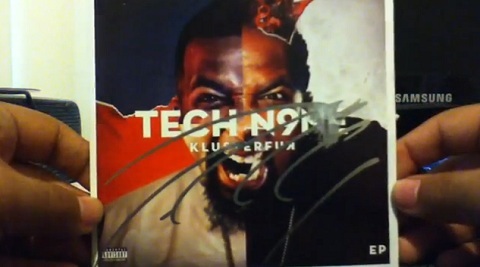 Tech N9ne’s KLUSTERFUK EP has everyone in Strangeland excited as pre-orders for the release were shipped early, giving Technicians something to show off. With ¡MAYDAY! behind the boards, KLUSTERFUK is a new experiment in Tech N9ne’s sound and features appearances from Krizz Kaliko, ¡MAYDAY!’s Wrekonize, and Aqualeo. Pre-orders for KLUSTERFUK gave fans a chance to own an autographed copy of the EP along with a snake and bat decal and a free download of “Blur” featuring Wrekonize. In this brief video clip, Freek0nALeash eagerly puts his pre-order on display for the world to check out. From the bold packaging to the maddening music contained within, Tech N9ne’s KLUSTERFUK is sure to shake up everyone’s perception of the Kansas City King.